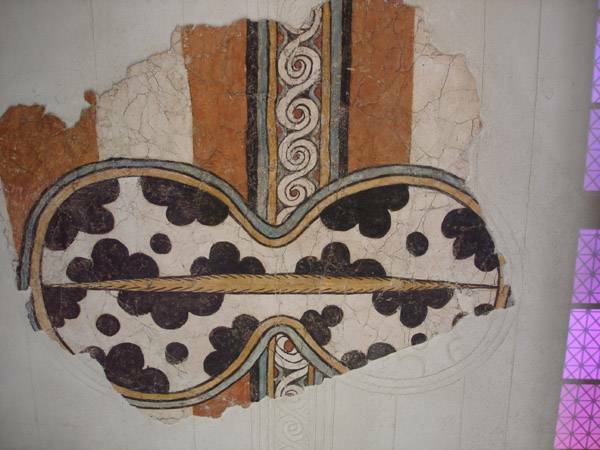 Wall paintings depicting figure-of-eight shields with a suspension strap at the middle. The motif on each shield's surface shows that they represent originals made of cow's hide. The figure-of-eight shield , a defensive weapon, becomes here the symbol of a war goddess. Although it is a common motif (models of this type of shield exist in gold , ivory and semi-precious stones), this is a rare representation in Mycenaean monumental painting. Athens National Archaeological Museum.